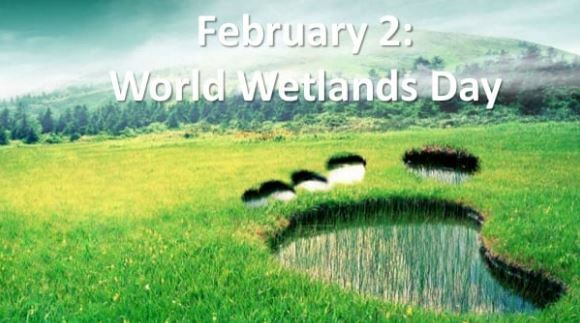 Each year on 2 February the world marks World Wetlands Day. In 2019 the theme is Wetlands and Climate Change. The international partners of the Ramsar Convention -IWMI, WWF, Birdlife, Wetlands Intl, Wildfowl & Wetlands Trust, and IUCN- are supporting the outreach for World Wetlands Day. Wetlands are a Natural Solution to Climate Change. The science is clear. Wetlands are the most effective carbon sinks on our planet. The Paris climate change agreement recognizes the role wetlands play in climate change. Today as people come together to celebrate World Wetlands Day, it is an ideal moment to reflect on the value of wetlands and how we can harness the natural power of this ecosystem to turn the tide on climate change. Peatlands for example cover just three per cent of our world. Yet they store nearly a third of all land-based carbon. This is twice as much as all the world’s forests. Coastal wetlands such as salt marshes, mangroves and sea grass beds are also some of the most carbon dense ecosystems on earth. Coral reefs and mangroves absorb the shock of storms surges and tsunamis in coastal areas, while Inland, wetlands soak up rain, reduce flooding and delay the onset of droughts. They are critical for climate adaptation and building resilience. Yet more than a third of all our wetlands were lost in just 45 years. Today, wetlands are disappearing three times faster than forests. The world’s corals face near extinction at 1.5ºC and certain extinction at a global warming of 2ºC. Wetland loss and degradation is a major concern, as it contributes to global warming by transforming these natural carbon sinks into emission sources. The burning and draining of peatlands accounts for a tenth of annual fossil fuel emissions – while wetland degradation contributes to nearly a quarter of global methane release. In 2018, Parties to the Ramsar Convention on Wetlands agreed to measures that protect, restore and sustainably manage peatlands and coastal eco-systems – As a recognition of the important role of wetlands in mitigation and adaptation to climate change. By restoring nearly 25 per cent of lost mangrove forests in two regions, Senegal will store half a million tons of CO2 over 20 years –This restoration project will also buffer 200,000 people against storms and strengthen food security by increasing fish and rice production. Denmark, Finland, Iceland, Norway and Sweden are intensively restoring the Nordic-Baltic peatlands to help regulate climate change and restore biodiversity. The loss of nearly half of these peatlands produces approximately a quarter of the region’s annual CO2 emissions. In Asia, the storm protection benefits of mangroves in southern Thailand have been valued at USD10,821 per hectare. Mangroves are being restored along the Krabi River Estuary to protect the coastal communities against tropical storms. While Indonesia will be restoring two million hectares of peatlands to ensure the devastating fires of 2015 and 2016 caused by drought and peatland draining – don’t happen again. The benefits are clear – what is required is more ambition to urgently amplify such initiatives. I encourage decision-makers to include wetland conservation and restoration in their national policies on climate change, in order to meet the ambition of the Paris Agreement. We can all contribute to reversing the loss of wetlands, so that we continue to benefit from the critical services they provide to nature and people. We have the solutions. We just need the will and action. We are not powerless against climate change.